RTCAR provides grants to nonprofit and governmental organizations that help carry out the mission to preserve, protect and teach the heritage of Cherokee traditional resources, land care and culture. These Grant Guidelines explain who is eligible for RTCAR support, RTCAR's funding priorities and how to apply for RTCAR grants. If your organization is on the Qualla Boundary or other tribal property of the Eastern Band of Cherokee Indians (EBCI), is it a tribal or community service organization? If your organization is not on the Qualla Boundary, will the work you want the RTCAR to help fund directly benefit the people of the EBCI. Development and preservation of traditional Cherokee arts? Are you already working with and coordinating with other groups that have similar goals, or do you have a concrete plan to begin working with others on the project you want to propose? It is important that regional entities seeking RTCAR assistance work in partnership with the EBCI, with both fully participating in the proposed program/project. The purpose of the Revitalization of Traditional Cherokee Artisan Resources initiative is to enhance the cultural environment on the Qualla Boundary, other tribal lands and the western North Carolina region. Here are some examples of activities and projects appropriate for RTCAR funding. These are just examples; we strongly encourage development of innovative approaches. Inventory and mapping of natural resources to establish what is presently available, where they are located and how to access them. Development of new and renewed sources for Cherokee arts (such as river cane), through habitat restoration or research that leads to sustainable harvesting techniques. Creation of a clearinghouse for natural resources information. 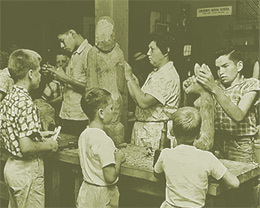 Elder involvement in teaching and mentoring younger tribal members so that future generations will understand and practice traditional Cherokee arts. Development of educational curricula to teach traditional methods of caring for and harvesting natural resources to be utilized by K-12, area schools, colleges and universities. Planning – Available to help develop project concepts. Funds can be used for office and meeting expenses, planning consultants, travel, and other costs related to outreach. Capacity – Available to enhance the education and skills in the preservation and management of artisan resources. Expenses could include workshops, training, planning, and research. Project Specific – Small projects that reflect RTCAR funding objectives. For carefully planned projects that demonstrate a high probability of creating a lasting impact on the RTCAR funding objectives. Read through the Grant Guidelines and Application Form carefully. Receive training about the RTCAR objectives and application process. See the grant calendar on the RTCAR web site to find the application deadline. Answer the questions in the Application Form in the order listed. All application materials must be typed or prepared in legible handwriting. Submit five completed Application Forms with the required attachments. Use plain paper and do not bind or place the proposal in a fancy cover. Do not attach videos, publications or organizational brochures unless they are directly relevant to the proposed project. Applications must be submitted via mail or hand delivered to the RTCAR office; faxed or emailed applications will not be accepted. Organizations may apply for one large and two small grants per year. Projects may be funded for up to three consecutive years. Approved grant payments will be made after grantee attends an orientation session at the Cherokee Preservation Foundation. The lead entity/grantee cannot request additional funding within 12 months of approval, except with prior agreement by the RTCAR project director. RTCAR cannot be the sole source of funds for a proposed project. Preference will be given to projects that have multiple and/or new sources of support (including in-kind). Once a project is approved, the recipient will be notified in writing. A grant agreement, between RTCAR and the grantee, outlining the responsibilities of each party will be signed prior to the release of funds. The grantee must submit required reports on project and financial activity by the end of the grant period, and prior to submitting another grant application to RTCAR. Project costs incurred prior to written authorization from RTCAR will be ineligible for reimbursement.